Our dog, Shiner is 11 years old which makes her a senior pet. As pets age, they can sometimes experience health issues like aches and pains associated with arthritis and other age-related chronic illnesses. No one likes to think about their pet growing old or getting sick, but it's something we should all be ready to deal with. And wouldn't you love to prolong the amount of time you have to spend with them? For the past two weeks, Shiner has been taking Revitamal which is an anti-aging supplement for pets. Revitamal starts working immediately to restore your pet's functions, comfort, energy level, and vitality. This supplement is like a fountain of youth for pets in a bottle. What really grabbed my attention with Revitamal is that it can be used for all pets of all ages, except for fish. I love small pets, and my rat recently passed away back in April. I can't wait to use Revitamal anti-aging supplement for my next pet rats. Their life expectancy is only about 2 years or so and I would love to extend that short period of time if possible. Shiner is a pretty healthy senior dog with no chronic illness thankfully. She can be pretty lazy at times though and does enjoy lounging around on the couch. I noticed the change in Shiner's energy level with Revitamal one morning a few days after we started the supplement. I was still asleep and rolled over to find her staring at me as if she was saying "Come on Mom! Let's go!" She started wagging her tail and licking me. I rolled over for 5 more minutes and there she was again telling me to get up and go. For Shiner, this is unusual behavior. She never wakes me up like this. I also notice that Shiner seems more energized and ready to play than before. I believe that Revitamal will only continue to help her thrive. Revitamal is easy to give also. I just add Shiner's required dose to her food every evening at dinner time. She loves it! It doesn't really have any sort of odor to it, so I'm thinking it may be easy to hide for more picky eaters. Curious as to how this miracle supplement works? It removes toxins and supports healthy cellular maintenance. This makes it the perfect "complementary therapy" to other treatments like prescription medications. In the video below, Dr. Marcus Gitterle, Chief Clinical Officer, explains how Revitamal works. 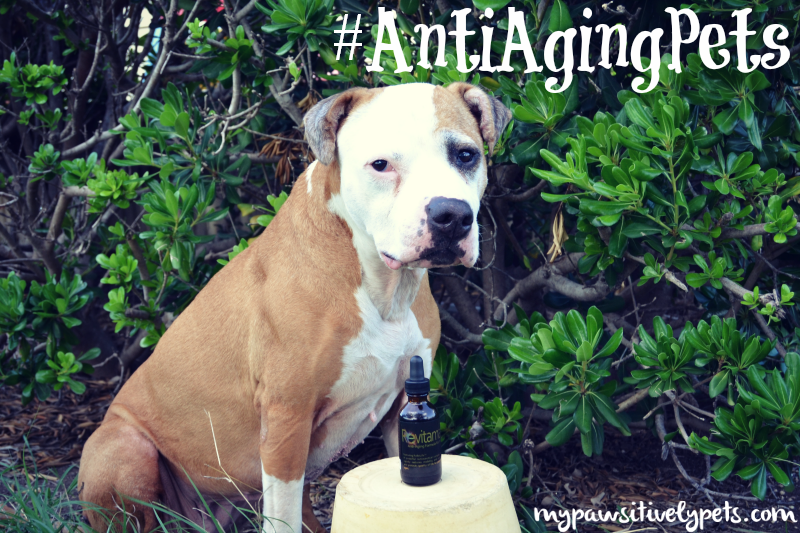 The interview is mostly dog focused, but you will still get a good idea of how this anti-aging supplement works. And don't worry, Revitamal is 100% USA Made. All of the ingredients are USA sourced, including the glass bottle that Revitamal comes in. All ingredients in Revitamal exist naturally and it does not include animal by-products. It is made to human grade standards. Want to give Revitamal a try? We have one bottle of Revitamal, valued at $34.95 to give away to one lucky reader. This giveaway ends June 29th at midnight CST. One winner per household. This giveaway is open to US residents ages 18 and up only. To enter, simply fill out the Rafflecopter form below. Good luck! This post is sponsored by Revitamal and the Pet Blogger Network. I am being compensated for helping spread the word about Revitamal, but Pawsitively Pets only shares information we feel is relevant to our readers. Revitamal and AdaptoGenerations Inc are not responsible for the content of this article. Sounds interesting. Loved to know if it actually does show positive outcomes? Have a tremendous Thursday. Well, yes of course! If you mean by extending pet's lives, the oldest dog on Revitamal is a 23 year old labrador. That's almost unheard of for that breed. That is interesting. We had the same question as Molly! Anything that helps is a good thing! I have heard this stuff is amazing! I can't enter the giveaway, but I would like to check this stuff out for myself though. Great post! Oh really? That is awesome! I will stop by to read your post here in a little bit. I'm not familiar with this product but with Sammy at age 14 I'm all for something that will keep him thriving and happy into his super senior years. We'd love to give it a try!!! Yes Rachel! I am definitely going to use this on my next rats. 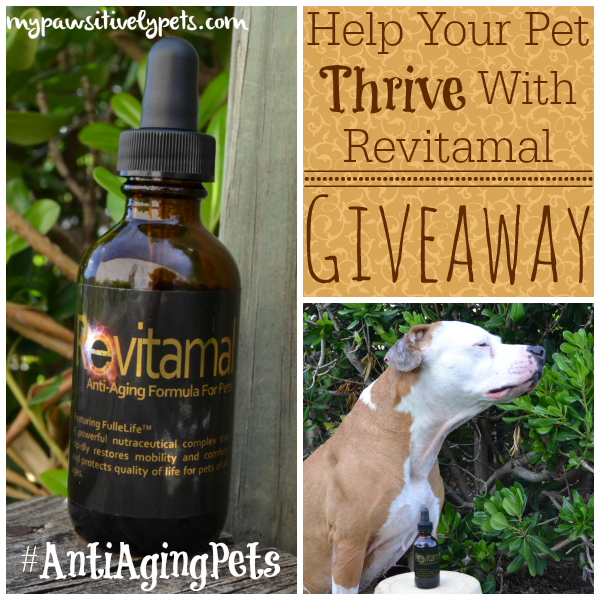 At the #BlogPawsChat on Twitter with Revitamal, I asked about it and they said it could extend their life to 3+ years. First, Shiner is 11? I always thought she was a young dog. Wow. I'm glad she's healthy and it sounds like these supplements may help keep her that way. My dogs are young, but we all of course want to do anything to extend their time with us. This looked like a great product! I will check it out for my cats. Thanks for the excellent review. My dog is like Shiner in that he prefers to lounge around much of the day. I would be curious to see if this products helps give him a little more energy. Oz, you are a senior too?! I must find out your age now... you must be like 7 or something? We're really interested in seeing the Revitamal posts. We won a bottle at the BlogPaws Chat, but we haven't started taking it yet. It does sound very promising! I haven't seen any of the cat Revitamal posts yet, so am interested in seeing what those people have to say about it. If I won I would give it to my sister's 14 year old Pug to try. She is showing her age these days. Revitamal sounds amazing. At what age is it best to start giving it to a dog? You can start at any age Jennifer. They don't have to be elderly. I'm sure the younger you start, the better a job it will do at ensuring a longer life. I do anything and everything I can to help my dogs. I would love to win this. 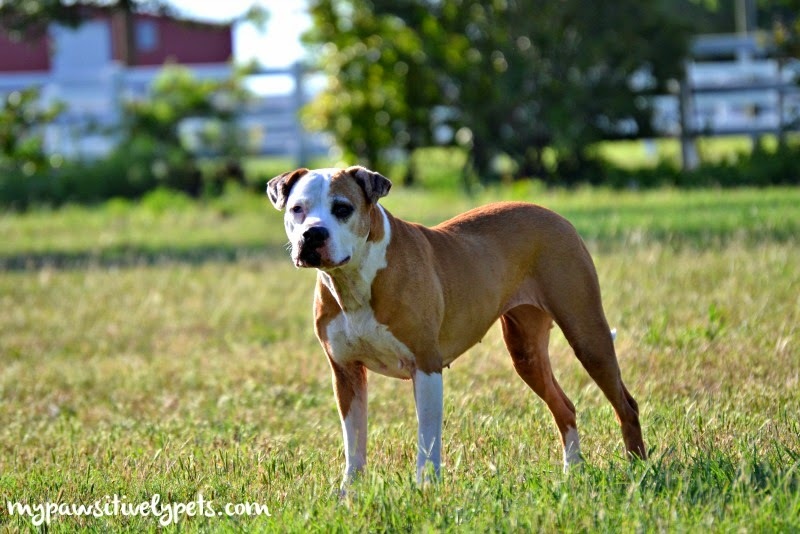 Shiner is such a gorgeous "old" girl. Very interesting. I'd love to win this and try it out. My doxie is 15, and she's definitely slowing down. I'm wondering what kind of difference this could make for her. For older dogs who may already have some health issues, Revitamal advises that results may take longer to see. But you should notice some change with time. Oh yes! I bet that it would be great for them! That's SO great that you're seeing positive results with Shiner! We were skeptical... what with the "anti-aging" talk and all. But we're believers now! I've been giving it to Katie (nine year-old kitty) now for about 10 days and the preliminary results are nothing short of amazing! I couldn't be happier. Same here. We have experienced subtle changes here and there, possibly not as dramatic as Katie's. I think it's a great product! I can't believe all the great things I'm hearing about this! Our dogs are pretty active, but I would love to give it to the cats to try to liven them up a little and keep them healthier. I was skeptical when I first heard of it, but I am far less so now that I'm reading these great stories. Some of the cat reviews that I've been reading are just absolutely amazing! I have a couple of cats who I would like to give this product to. They are getting up there in age. I would really interested in trying this on some of our senior foster pups! This will help me keep my pup alive & thriving longer :-) what a great giveaway! I have all senior dogs and I would love to try this to see if it helps with some minor issues a few of them are having. Anything for my babies! Well, hopefully it would help :) Good luck! Nice post Ann, I wonder though, about three things: What really is the "correct" age to consider using this AND once you stop must you administer for the rest of their life? Lastly, if you decided to stop (for whatever reason) what withdrawal or side effects are there? Your thoughts? I think it depends on the animal. I don't see an exact answer on their FAQ page. I think you need to look at your dog and decide. Ask questions like do they have health problems like arthritis, cancer, etc? Are they energetic? Is their health declining? For older dogs, with more health problems it may take longer to see results. You certainly don't have to give it for their whole life, but it could be beneficial. After our review, I actually got really busy and forgot to give it to Shiner for 2 days in a row. I did notice an energy decrease. But it went back up again when I gave it again. I think if you stopped, you wouldn't be seeing the beneficial results that it offers. It wouldn't hurt your dog in any additional way if you stopped, but you would probably notice them going back to their old self.